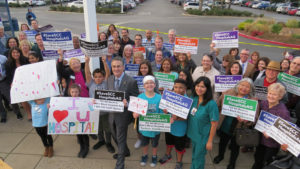 Santa Clara County Supervisor Mike Wasserman, who represents South County, is flanked by residents opposing the State Attorney General’s efforts to block the sale of St. Louise and O’Connor hospitals and the De Paul Health Center in Morgan Hill. South Valley residents have rising hopes St. Louise Regional Hospital will not close permanently. 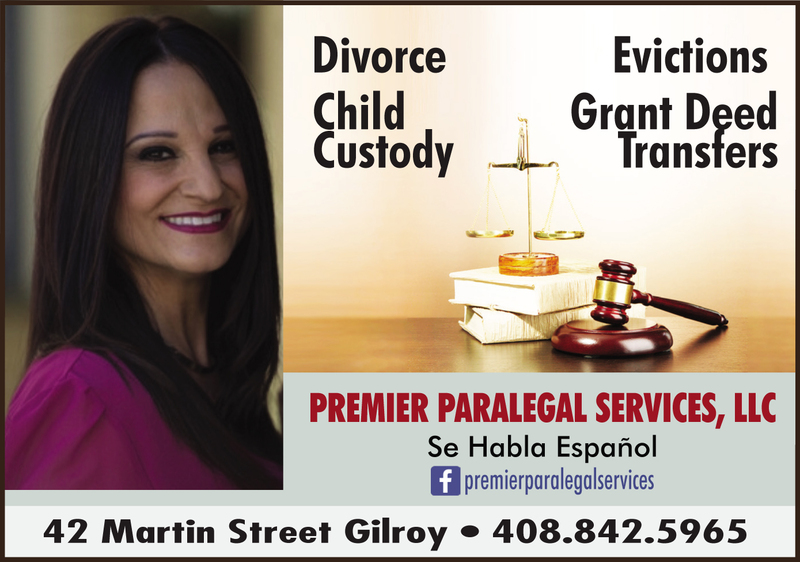 A bankruptcy court in Los Angeles ruled Jan. 30 against California Attorney General State Attorney General Xavier Becerra’s attempt to delay the sale of the Gilroy medical center to the county. The sales agreement between the county and Verity Health Systems of California requires the $235 million purchase of St. Louise in Gilroy, De Paul Medical Center in Morgan Hill and O’Connor Hospital in San Jose to close by the beginning of March. County officials consider the judgment a victory because any delay could lead to the closure of the hospitals, they argued in court. Becerra could appeal the decision, but as of Friday’s press deadline no announcement had been made public. 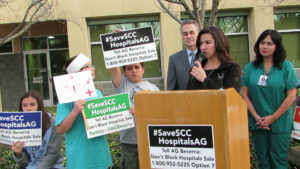 Christina Rodriguez, with Valley Health Center in Gilroy, speaks to a crowd gathered at St. Louise Hospital Jan. 29 to protest Attorney General Xavier Becerra’s petition to block the sale to the county of the hospital along with O’Connor Hospital in San Jose and the De Paul Health Center in Morgan Hill. Becerra attempted to block the sale of the two financially struggling hospitals because he believes the county has not agreed to operate them in a way that would protect healthcare access. The AG contends any sale of hospitals owned by Verity must adhere strictly to all conditions set down three years ago by his predecessor, Kamala Harris. County officials including Supervisor Mike Wasserman said the AG’s action could end up shuttering the hospitals entirely. Holding signs and making speeches, about 60 South Valley residents and Wasserman held a sunset rally in front of St. Louise’s entrance the evening prior to the ruling to express their concerns the Department of Justice’s attempt to postpone the county’s purchase of three medical facilities including St. Louise would risk lives and cost the jobs of at least 1,500 employees. Although dozens of organizations inquired about purchasing the hospitals, only the county made an offer to Verity to buy the three facilities. 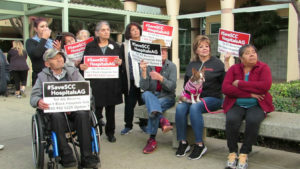 The supervisor joined a group of South Valley residents who attended a Jan. 24 press conference in San Jose to protest what they saw as the AG’s interference in the deal between the county and nonprofit Verity Health. 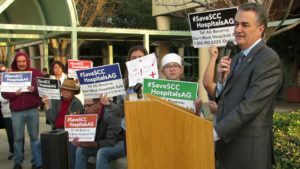 At that event, Santa Clara County CEO Jeff Smith stood in front of a group of hospital workers, elected officials and South Valley residents holding signs with the hashtag, #SaveSCChospitalsAG. He told them Becerra cares more about maintaining “power and control” over regulations than making sure South Valley has a public hospital to take care of its residents’ medical needs. Smith said the county has done all it can to appease the Attorney General. “Attorney General Becerra has rejected all our good-faith efforts to resolve his objections to the county purchasing the hospitals,” Smith, a medical doctor and lawyer, told members of the media attending the press conference. 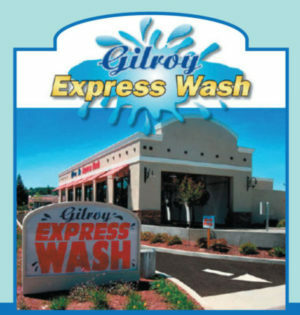 Gilroy Mayor Roland Velasco said he was pleased with the judge’s ruling. In his decision, Robles said the public interest weighs strongly against Becerra’s request to postpone the sale. Because Verity lacks the funds to maintain operations pending a sale to another buyer, it would be forced to close. The report also said postponing the sale would harm hospital employee morale by adding uncertainty into their lives and careers. Verity filed for bankruptcy Aug. 31. Facing an uncertain future, 104 employees left between Sept. 4 and Dec. 28.